Haryana District Yamuna Nagar soon going to have its 6 earthen dams in different tributaries. These dams would not only sort the water issue but would increase the tourism and employment possibilities in District. Considering the same, Irrigation department along with Forest and wildlife department have seen the all possibilities to make this project a successful mission. As per report sent to Central Government on this, the department is ready to start the work at the six different tributaries namely Chiken Dam, Darpur Dam, Nagli Dam, Khilanwali Dam, Ambawali Dam and Kansli Dam. 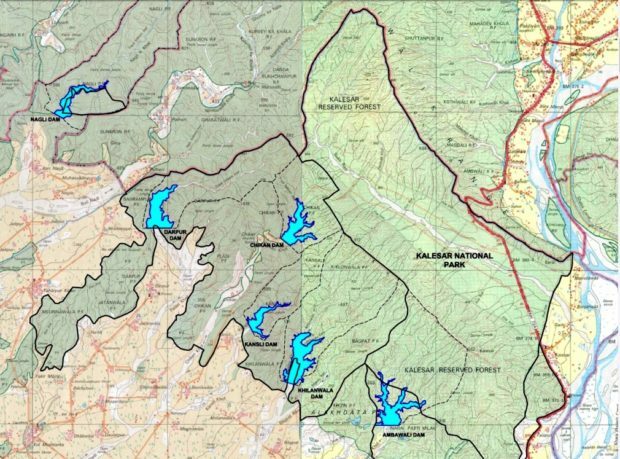 These Dams have different catchment areas. The Dam site is selected in such a way that it has maximum storage at minimum height for the economical reason and there us least disturbance to inhabitation upstream with maximum benefits to people living in watershed zone. It is also having firm embankments. The catchment area of the Dam is 8.25 sq. km. Rain Gauge area at Paonta Sahib has been used to gather the precipitation of the area. As per the report the Dam would certainly irrigate 5000 Gross command area and 2550 Culturable Command Area. With these dams the 5 adjoining villages namely Tarpur, Bir-Tarpur, Haidapur, Jaitour, Mehran which are rain dependent villages would surely get huge benefit out with these water storage as huge crop production can be made after the dam came into existence. It is also mentioned in report that construction of dams would surely invite different type of birds, specially the cranes. As such area can be developed by Tourism department later by providing tourist attraction such as bird life sanctuaries, picnic spots and gardens etc. It would also increase and better the employment chances, aquatic life, wild life in that area.